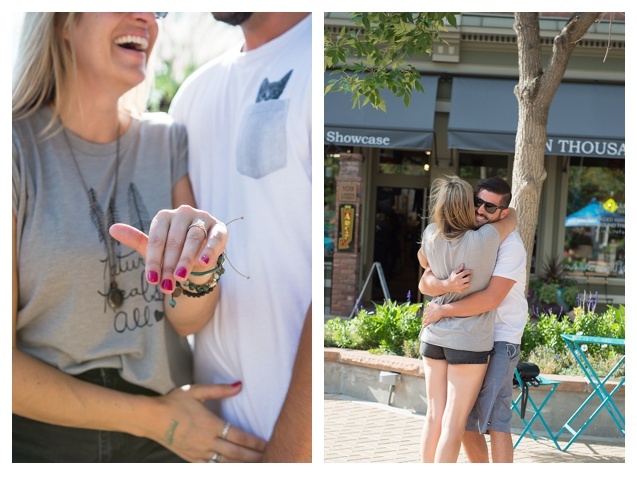 I was SO excited when Tommy reached out to me and told me he was going to propose in Fort Collins to his long time girlfriend Michelle and then asked me if I would photograph it for them! I said of course I would love to do that for them. I worked with Tommy about 6 years ago when he had just started dating Michelle so I was so happy to hear he had decided to propose! Tommy and Michelle met when they were attending CSU in Fort Collins and had their first date in Old Town Square. Tommy thought Old Town would be a perfect spot to pop the question! They currently live in California and came into town to attend the first football game at the new stadium. Tommy had it all set up, they went on a bike ride with some friends where poor Michelle fell off her bike and scraped up her leg and then had some friends drop them off in Old Town Square where I was waiting patiently. Tommy found a court yard that was not to packed with people knelt down on one knee and asked her to marry him, Michelle was totally surprised and said yes of course! Tommy had also had some friends and family waiting and watching secretly in a restaurant close by so they were able to share the exciting news! I have decided proposals are my new favorite event to photograph I hope I can photograph more. I was honored to be apart of this special moment and I REALLY hope I get to travel to Cali to photograph the wedding! Congratulations Tommy and Michelle!